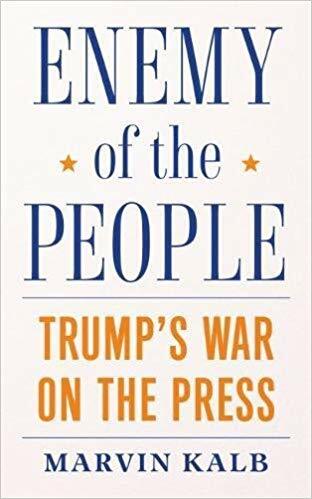 Marvin Kalb, distinguished journalist, will speak about his new book, Enemy of the People, on Monday Nov. 12 in Nashville as part of the Seigenthaler Series. First Amendment Center President Ken Paulson will host a discussion on Monday, Nov. 12, with distinguished journalist Marvin Kalb about his new book that examines President Donald Trump's attacks on the press and the danger it presents to American democracy. The event is the final installment of the two-year Seigenthaler Series at the John Seigenthaler Center on Vanderbilt Univeristy's campus in Nashville. Kalb is the Edward R. Murrow Professor Emeritus at Harvard’s Kennedy School of Government and senior fellow with the Foreign Policy program at Brookings Institution. His 30-year journalism career included reporting for both CBS News and NBC News, where he served as chief diplomatic correspondent, Moscow bureau chief and anchor of NBC’s "Meet the Press." He was the founding director of the Shorenstein Center on Media, Politics, and Public Policy at the Kennedy School. In the preface of his new book Kalb explains why he decided to write on Trump's war with the press at this stage in his life, having just finished the first volume in a projected three-volume memoir sharing his eyewitness account of upheaval in the Soviet Union in 1956. "Did I want to be distracted by Trump's war on the press," he asked. He concluded the answer was yes. "If Trump wanted to fight for his vision of America, then I had no option but to fight for mine..."
"In my career, I spent a lot of time covering the Soviet Union. It was governed by communists. They had little taste or understanding of personal freedom, much less press freedom. Everything was determined by the vozhd, the Russian word for a strong leader who ran everything from the Kremlin, who thought he knew more than anyone else. As a result, everyone, from doctors to reporters, had to stand up and salute – never to rock the boat, never to be critical of him or his policies. "I did not like that arbitrary style of governance then, and I don't like it now. What I have learned over the years – and many have accumulated – is that only a free press can truly protect us from authoritarian government. Only a free press can insure a continuation of a vibrant democracy. The two are inseparable. "If a political leader finds it to his advantage to attack a free press, to humiliate it, to disparage it, he is really attacking democracy at its core, and that has no place in this country." VIDEO: Marvin Kalb discusses attacks on the press with New York Times Executive Editor Dean Baquet and Washington Post Executive Editor Martin Baron.